If you're a professional or budding home mechanic, then your workshop won't be complete without a good impact socket set. Our high quality Chromium-Molybdenum impact socket sets can be used with the range of impact wrenches we have available, or paired with your existing wrench to make even the most challenging jobs easy. Browse our range of impact wrench sets below. Whether you need an imperial socket set or metric socket set, we have all such options for sale in our online store. 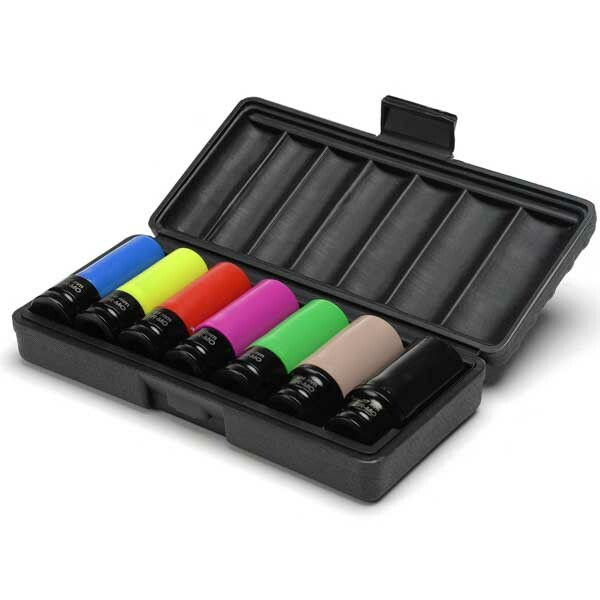 Each impact driver socket set is the perfect accessory for all types of air wrenches and air guns. Impact wrench sockets for thin walls and heavy duty tasks can all be found, so you can pick up the best impact socket set for the job at hand. At SGS Engineering we design and supply some of the finest cheap socket sets for trade and DIY use. Affordable and high quality, they guarantee reliable usage for years to come, with many different sizes of the sets and impact sockets available. Have a look through our collection of cheap socket sets for sale and choose one that suits your needs. Air tools and their additional compressor accessories are just what you need for a wide range of DIY activities, whether it be: drilling, hammering, sanding, grinding, cutting, nailing, stapling, wrenching and more. Please also refer to our how-to guides and safety information when using any of our air powered tools.